Not all waves are created equal. Start on small surf, and work your way up to big surf only when you think you're ready. Ask yourself: are the waves dumping or spilling? Dumping waves are much riskier to surf than spilling waves. A dumping wave pitches forward, while a spilling waves crumbles at the top. Dumpers are caused by swell and big enough wind waves. Dumpers are usually found in low water conditions--low tide, high sandbar, shallow bottom. 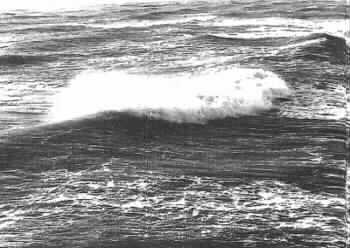 Spilling waves are caused by wind waves or dissipating swell and are most likely found in high water conditions--high tide, high sand bar, deep bottom. You can kayak-surf straight in on a spilling wave. You need to be moving at the same speed as the wave, just like bodysurfers and board surfers. Time your arrival with that of the wave at the breaking spot on the beach. If you don't match wavespeed the wave will run right over you or turn you into the wave where you are likely to roll unless you brace. I would suggest starting in a double sit-on-top kayak--it's easier to match the speed of the waves with two paddlers--then progressing to a single. Another landing technique is to position yourself right behind the breaking wave and do not allow yourself to be pushed out in front of the wave. Ride the mound of water all the way to the beach. Figure out the wave interval from buoys or on-the-water observations BEFORE you go out. The smaller the interval, the less time you have between the waves. The longer the interval, the more time you have between waves. 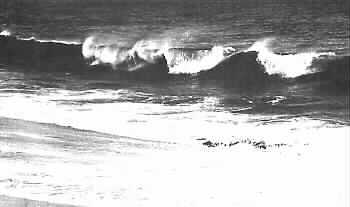 Long period swell usually arrive in sets with long windows of reduced wave action in between. Short period swells are much more constant and have less windows in between waves. Don't try to surf the shorebreak. In 35 years of ocean experience, most deaths and surfing injuries I have seen are from attempting to surf dumpers in shallow water conditions. I think a good way to survive shorebreak is to land a sit-on-top first by timing behind the mound of water and then assisting. Have decked boats land and launch sit-on-top style.